Sociology began as a historical discipline, created by Marx, Weber and others, to explain the emergence and consequences of rational, capitalist society. Today, the best historical sociology combines precision in theory-construction with the careful selection of appropriate methodologies to address ongoing debates across a range of subfields. This innovative book explores what sociologists gain by treating temporality seriously, what we learn from placing social relations and events in historical context. In a series of chapters, readers will see how historical sociologists have addressed the origins of capitalism, revolutions and social movements, empires and states, inequality, gender and culture. The goal is not to present a comprehensive history of historical sociology; rather, readers will encounter analyses of exemplary works and see how authors engaged past debates and their contemporaries in sociology, history and other disciplines to advance our understanding of how societies are created and remade across time. This illuminating book is designed for use in graduate and advanced undergraduate courses as an introduction to historical sociology and as a guide to employing historical analysis across the discipline. Richard Lachmann is professor of the sociology of culture and comparative/historical sociology at the University at Albany, State University of New York. He is author of States and Power and Capitalists in Spite of Themselves, winner of the 2003 American Sociological Association's Distinguished Scholarly Publication Award, the 2002 Barrington Moore Best Book Award Honorable Mention from the American Sociological Association's Comparative Historical Sociology Section, and 2001 Distinguished Publication Award from the American Sociological Association's Political Sociology Section. "Richard Lachmann's excellent, readable short survey of historical sociology gets to the heart of the enterprise: understanding the ongoing transformations that have created the world in which we live. 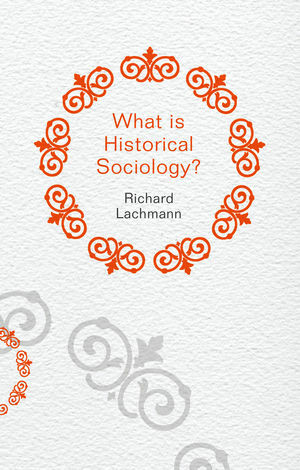 Lachmann provides incisive reviews of the major fields of research to which historical sociologists have contributed. The book will be a very useful text for those who would bring the concerns and approaches of historical sociology to the larger discipline - who want to historicize sociology in order to render it more vital and more grounded." "One of the major contributors to the 'historical turn' in late twentieth-century social sciences guides us through a fascinating journey in a discipline. By examining exemplary works in different sociological domains, Lachmann skillfully sketches the varied concerns of historical sociology. Written in a readable and engaging style, What is Historical Sociology? is a must read, and not just for those interested in (historical) sociology."